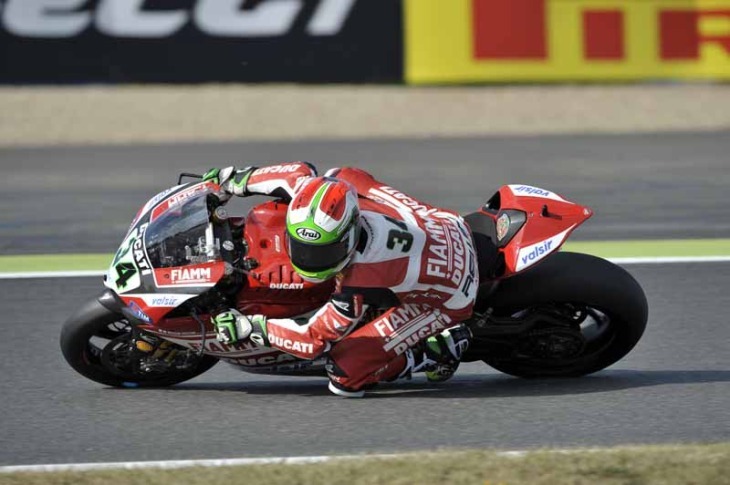 Magny-Cours (France), Friday 3 October 2014 – The afternoon session at Magny-Cours finished with Italian Davide Giugliano (Ducati Superbike Team) setting the fastest time in 1’37.866s, to head the combined classification after FP1 and FP2. With only Leon Haslam (Pata Honda World Superbike Team) and Claudio Corti (MV Agusta Reparto Corse) failing to improve out of the top twenty riders in the overall standings, the 45 minute session was fast and furious with 5 manufacturers represented in the first six places. Behind Giugliano, Eugene Laverty (Voltcom Crescent Suzuki) was 2nd ahead of this morning’s pace setter Sylvain Guintoli (Aprilia Racing Team). Jonathan Rea (Pata Honda World Superbike Team), Marco Melandri (Aprilia Racing Team) and reigning champion Tom Sykes (Kawasaki Racing Team) completed the top six with Loris Baz (Kawasaki Racing Team), Chaz Davies (Ducati Superbike Team), Alex Lowes (Voltcom Crescent Suzuki) and Leon Haslam (Pata Honda World Superbike Team) filling the remaining places inside the top ten. Niccolò Canepa (Althea Racing Ducati) made a huge step forward, moving into 14th overall and in doing so becoming the best classified EVO rider. As it stands Fabien Foret (Team Pedercini Kawasaki) would be the final rider to take part in Tissot-Superpole tomorrow, but with one final session to come to decide the participants anything can still happen. Results: 1. Giugliano (Ducati) 1’37.866 average 162.259 kph; 2. Laverty (Suzuki) 1’38.138; 3. Guintoli (Aprilia) 1’38.152; 4. Rea (Honda) 1’38.157; 5. Melandri (Aprilia) 1’38.451; 6. Sykes (Kawasaki) 1’38.518; 7. Baz (Kawasaki) 1’38.647; 8. Davies (Ducati) 1’38.747; 9. Lowes (Suzuki) 1’38.888; 10. Haslam (Honda) 1’39.040; 11. Fores (Ducati) 1’39.265; 12. Neukirchner (Ducati) 1’39.308; 13. Elias (Aprilia) 1’39.439; 14. Canepa (Ducati) 1’39.548; 15. Salom (Kawasaki) 1’40.022; 16. Barrier (BMW) 1’40.170; 17. Lanzi (Ducati) 1’40.256; 18. Morais (Kawasaki) 1’40.677; 19. Corti (MV Agusta) 1’40.924; 20. Foret (Kawasaki) 1’40.961; 21. Guarnoni (Kawasaki) 1’41.217; 22. Andreozzi (Kawasaki) 1’41.647; 23. Staring (Kawasaki) 1’41.980; 24. May (EBR) 1’42.701; 25. Rizmayer (BMW) 1’43.023; 26. Toth (BMW) 1’43.432; 27. Yates (EBR) 1’43.590; NC. Salchaud (MV Agusta) 1’45.484. Results: 1. vd Mark (Honda) 1’41.744 average 156.074 kph; 2. Tamburini (Kawasaki) 1’41.947; 3. Mahias (Yamaha) 1’42.115; 4. Marino (Kawasaki) 1’42.230; 5. Coghlan (Yamaha) 1’42.277; 6. Roccoli (MV Agusta) 1’42.305; 7. Sofuoglu (Kawasaki) 1’42.412; 8. Kennedy (Honda) 1’42.422; 9. Zanetti (Honda) 1’42.496; 10. Schmitter (Yamaha) 1’42.560; 11. Jacobsen (Kawasaki) 1’42.590; 12. Cluzel (MV Agusta) 1’42.610; 13. Nocco (Kawasaki) 1’42.657; 14. Baldolini (Honda) 1’43.045; 15. Rolfo (Kawasaki) 1’43.068; etc.